Eat your fruits and vegetables in style! Eating colourful is not just a treat for your eyes, but also for your health. Unless you are allergic, there’s not a lot you can do wrong by regularly eating fruit and vegetables as an integral part of a healthy diet. Five small portions a day seems to be the generally accepted recommendation. Fruit and vegetables absolutely belong on our plates, as they help reduce the risk of diabetes and other chronic diseases and provide the body with important vitamins, dietary fibre and other nutrients. Agreed: fruit and vegetables are good for our health, you probably knew that already. But, you can still improve your eating habits by paying closer attention to the colour of your food. The magic word that makes the colours of the food we eat so important is phytochemicals. 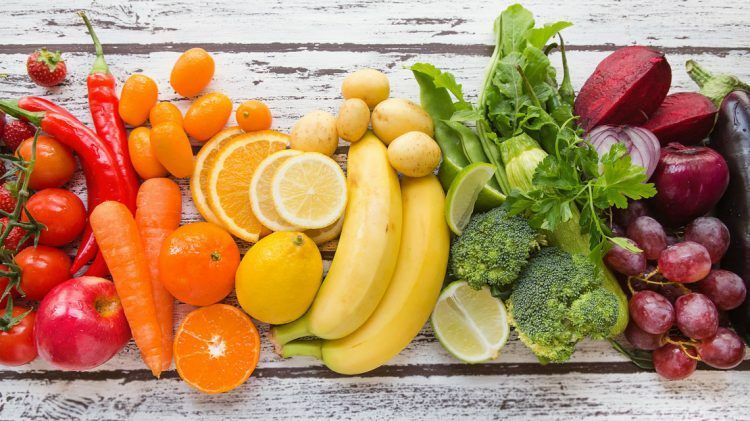 Phytochemicals are chemical compounds produced by plants and they are, among other things, responsible for giving fruit and vegetables their colour. One specific group of phytochemicals, the non-digestible fibre from plant foods, has approved health benefits like reducing the risks of certain types of cancer and coronary heart disease. Behind every colour group hides a special health benefit. Red: The red colour stems from a plant pigment called lycopene, which is a powerful antioxidant and is said to reduce the risk of cancer, strokes and heart disease. Fruits and vegetables containing lycopene are: tomatoes, radishes, strawberries, rhubarb, cherries, etc. Orange/Yellow: Brightly coloured by carotenoids, this group has a lot to offer. The colour comes from beta-carotene, a carotenoid found for example in carrots, pumpkins, and sweet potatoes. Our bodies convert beta-carotene into vitamin A, which helps maintain healthy mucous membranes and healthy eyes. Oranges and corn contain relatively high levels of another carotenoid called lutein. Lutein also promotes eye health. Members of the citrus family – such as lemons, mandarins, or grapefruits – not only contain high amounts of vitamin C but also function as a digestive aid. Blue/Purple: The plant pigment anthocyanin provides the colour for blue/purple fruits and vegetables like eggplants, beetroots, red cabbage, blackberries, blueberries or plums. Blue and purple foods contain high amounts of vitamin C, folic acid, potassium and dietary fibre. Green: Spinach, kale, broccoli, kiwis and green apples are just a few examples of this big colour group, containing a variety of phytochemicals, vitamins and dietary fibre. Kale, for example, is packed with vitamin K, A, and C, iron, antioxidants, and plant-based calcium. Green apples can help you maintain digestive and intestinal health and provide a tasty treat that’s low in fat. No wonder green smoothies are so good for us. Brown/White: The onion family with members like scallions, chives, and garlic contains a phytochemical called allicin, which is said to help lower cholesterol, blood pressure, and to fight off infections with its antibacterial properties. Bananas and potatoes are a good source of potassium. Sorting food by colour is a helpful way to get a better hold of the whole spectrum while not having to know all the nutrients of every single fruit or vegetable. “Eating a rainbow” will not magically cure diseases, but it may help you stay healthier and to add more diversity to your eating habits. “Eating rainbows” can be fun for you (and/or your kids). Keep score of the colours you ate and compete with your roommates or family. Organise your pantry, kitchen shelf or plate, so the rainbow becomes visible. Assign a day of the week to each colour. Try new things by working through the colours. You might even discover some new deliciousness. Remember: It’s not hard if it tastes good.